NEW JERSEY -- On January 27, 1999, a tiger went walking through the town of Jackson, New Jersey. According to the zoology guidebook Wild Cats, a tiger's natural requirements are 'some form of dense vegetative cover, sufficient large ungulate prey, and access to water'. By those measures, Jackson is really not a bad place to be a tiger. It is halfway between Manhattan and Philadelphia, in the middle of Ocean County -- an easy commute to Trenton and Newark, but still a green respite from the silvery sweep of electric towers and petroleum tanks to the north, and the bricked-in cities and mills further south. Only 45,000 people live in Jackson, but it is a huge town, a bit more than one hundred square miles, all of it flat as a tabletop and splattered with ponds and little lakes. A lot of Jackson is built up with subdivisions and WaWa Food Markets, or soon will be, but the rest is still primordial New Jersey pinelands, broom sedge and jack pines and sheep laurel and peewee white oaks, as dense a vegetative cover as you could find anywhere. The local ungulates are maybe not up to what a tiger would find in more typical tiger habitats like Siberia or Madhya Pradesh; in Jackson, there are just the usual ornery and overfed pet ponies, panhandling herds of white-tailed deer, and a milk cow or two, unless you include those at Six Flags Great Adventure, which is stocked with zebras and giraffes and antelopes and gazelle and the beloved but inedible animal characters from Looney Tunes. But the Jackson tiger wasn't long for this world. A local woman preparing lunch saw him out her kitchen window, announced the sighting to her husband, and then called the police. The tiger slipped into the woods. By five that afternoon, a workman at The Dawson Corporation complained about a tiger in the company parking lot. By seven, the tiger had circled the nearby houses and returned to the Dawson property, followed by the Jackson police, state wildlife officials, and a surveillance helicopter. The tiger picked its way through a few more backyards and the scrubby fields near Interstate 195, resisted tranquilizer darts fired at it by the police, and headed in the general direction of a middle school; neighbors described seeing 'an orange blur'. Shortly after 9:35 that night, the tiger was shot dead by state officers, who had given up on capturing it alive. An examining veterinarian determined it had been a young Bengal male, nine feet long and more than four hundred pounds. Nothing on the tiger indicated where he had come from, and there were no callers to the Jackson police reporting a tiger who had left home. Everyone in town knew there were tigers in Jackson -- that is, everyone knew about the fifteen tigers at Six Flags Great Adventure. Note: Later articles say that DNA testing proved the tiger came from Marasek's property. But there were also other tigers in Jackson, as many as two dozen of them, belonging to a woman named Joan Byron Marasek. In fact, suburban Jackson, New Jersey has the highest concentration of tigers per square mile of anywhere in the world. 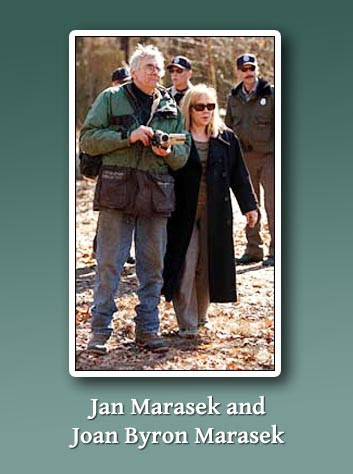 Joan Byron Marasek is famously and purposely mysterious. On videotapes made of her by the New Jersey State Exotic Captivity Permit Division -- which is the one of the only ways you are likely to see her, since she rarely leaves her compound, where she lives with her tigers, her husband, and eighteen or so dogs, except to go to court, where she has been fighting about her tigers for the past two years -- she looks small and unnaturally blonde, with a bobbed nose and a small mouth and a startled expression on her face. For instance, her age is a major mystery. She is either an oldish-looking young person or a youngish-looking old person. Evidently she has no Social Security number, which makes her actual age difficult to establish. She has testified that she was born in 1955 and was enrolled in New York University in 1968; when it was once pointed out that this would have made her a thirteen-year-old college freshman, she allowed as how she was not very good with dates. According to a newspaper report, she worked for a while as an actress and once appeared naked, riding a swing, in a production of Tom Stoppard's play 'Jumpers'. In a brochure for her tiger preserve she appeared wearing silver boots and holding a long whip and feeding her tiger Jaipur from a baby bottle. On an application for a wildlife permit, Marasek stated that she had been a circus performer with Ringling Brothers and L.N. Fleckles; had trained with Doc Henderson, the illustrious circus veterinarian; and had read, among other books, The Manchurian Tiger; The World of the Tiger; The Deer and the Tiger; Wild Beasts and Their Ways; My Wild Life; They Never Talk Back; and Thank You, I Prefer Lions. In 1976 the Maraseks bought eleven acres in Jackson and moved there with Bombay, Chinta, Iman, Jaipur, and Maya, five Siberian tigers they had gotten from animal trainer David McMillan. Their land was in a featureless and barely populated part of Jackson called Holmson's Corner, near the intersection of Monmouth and Millstone Roads. There was not much besides a church and a few houses nearby. One neighbor was a Russian Orthodox priest who ran a Christmas tree farm next to his house; another lived in a gloomy bungalow with a rotting cabin cruiser on cement blocks in the front yard. Marasek held both an exhibitor's license from the United States Department of Agriculture, which supervises animal welfare nationally, and a theatrical animal permit from the state of New Jersey, which is granted to wild animal owners who declare that their animals will be used for education or performance. Not long after moving to Jackson, she got six more tigers -- Bengal, Hassan, Madras, Marco, Royal, and Kizmet -- from McMillan and from Ringling Brothers. The next six -- Kirin, Kopan, Bali, Brunei, and Burma -- were cubs born in the backyard after Marasek allowed her male and female tigers to commingle. She did lose some of her animals. Muji died after a bad reaction to an injection. Diamond had to be euthanized after Marco tore off one of his legs. Marco also killed Hassan in a fight in 1997, on Christmas Eve. Two other tigers died after eating road-killed deer that Marasek now thinks might have been contaminated with anti-freeze. But more cubs were born, and more tigers were purchased, and the tiger population of Holmson's Corner steadily increased. 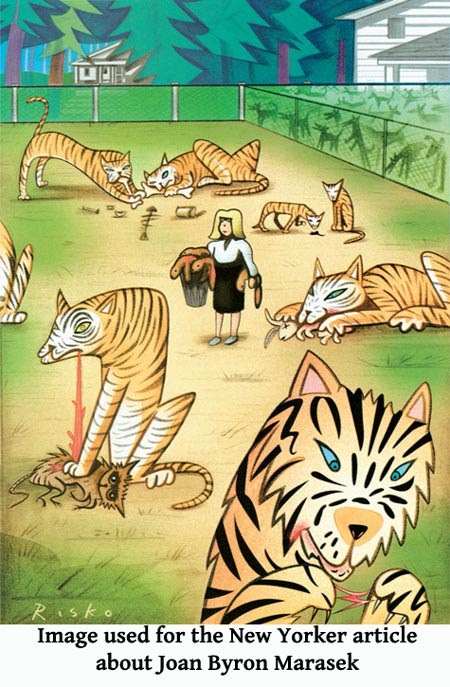 By the time the tiger walked through town, The Tiger Lady of Jackson had at least seventeen tigers in her backyard. You know how it is -- you start with one tiger, then you get another and another, and then a few are born and a few die, and you start to lose track of details like exactly how many tigers you actually have. As soon as reports of the loose tiger came in, the police asked everyone in Jackson who had tigers to make sure all of them were accounted for. Six Flags Great Adventure had permits for fifteen and could account for all fifteen. 'Joan, I have to entertain the notion that there are five cats loose in town, not just one,' one of the officers says on the videotape. Marasek's lawyer, Valter Must, explains to the group that there was some sloppy math when she filed for the most recent permits. The officers shift impatiently and make a few notes. 'For instance, I don't always count my kids, but I know when they're all home,' Must says. 'You don't have twenty-three of them,' one of the officer says. 'You'd probably know if there were six missing,' the officer adds. 'I would agree,' Must says. Marasek insists that no matter how suspicious the discrepancy between her permit and her tigers appears, the loose tiger is not hers. No, she does not know whom it might belong to, either. And gentlemen, please don't stick your fingers into anything, please: I'm not going to tell you again. The officers criss-cross the property for hours and come back the next morning to try counting tigers once more. They ask to see Marasek's paperwork. She tells them she is embarrassed to take them into her house because it is a mess. The tiger quarters look cheerless and bare, with concrete floors and chain-link fences and blue plastic tarps flapping in the January wind, as forlorn as a bankrupt construction site. During the inspection, a ruckus in one of the tiger pens starts up. She told reporters afterwards that she was furious about the state inspection. The day of the tiger count was the first time the state had inspected the Maraseks' property in years. New Jersey paid some attention to animal welfare -- for instance, the Scotch Plains Zoo was closed in 1996 for substandard care -- but didn't spend the money or the time to monitor most of its permit holders. There had been a few complaints -- 'It had been reported to us that between the hours of 4AM and 6AM that recordings of music or jungle drums would be played over the public address system, and that your tigers would roar,' the State Office of Noise Control wrote to Marasek in 1983, warning that there would be regular monitoring of her facility for roaring -- but the roaring was never measured again and the occasional inquiries about strange odors were never answered. Her permits were renewed annually without delay, even as the number of animals increased. There were deer carcasses scattered around the property, rat burrows, and thirty-five large angry dogs in a separate pen near the tigers. The one wandering tiger suddenly seemed inconsequential; the inspectors were now much more concerned about the fact that Marasek had at least seventeen living in what they considered sorry conditions, and that the tigers were not being kept for theatrical or educational purposes but as illegal pets. Anyone with the type of permit Marasek had must file information about their animals' work schedule, but the state had no records of the tigers ever performing or anyone attending an educational program at Tigers Only. The one Marasek tiger with a public profile was Jaipur, who weighed more than one thousand pounds and was listed in the Guinness Book of World Records as the largest Siberian tiger in captivity. In court papers, Marasek also described Marco as 'a great exhibit cat' -- this was by way of explaining why she doted on him, even though he had killed Diamond and Hassan -- although as far as anyone could tell, Marco had never been exhibited. It has never been proven that the loose tiger belonged to Marasek. DNA tests and the autopsy were inconclusive. Some people think it might have been a drug dealer's guard animal, which is apparently the fate of many surplus lions and tigers, and had run away or been emancipated for some reason; others say it was a pet that had gotten out of hand, and was dropped off in Jackson in the hope that the Tiger Lady would take it in. And there will always be conspiracy-theorists in town who believe that any animal escapes from Six Flags would be covered up, since the park is the largest taxpayer and biggest employer and certainly the primary attraction in Jackson since it opened in 1974. In the end, however, the tiger has simply been relegated to the annals of suburban oddities -- a lost soul, out of his element, doomed to his unhappy end, whose provenance will never be known. It is not hard to become a person who has a lot of tigers. Only eight states prohibit the ownership of wild animals; three states have no restrictions whatsoever; the rest have regulations that range from trivial to modest and are barely enforced. For a long time, there were no restrictions in New Jersey on owning wildlife. But in the seventies, there were regular reports of monkey bites and tiger maulings, and beginning in 19TK, exotic animal owners had to register with the New Jersey Department of Environmental Protection. Dangerous exotic animals were permitted only if it could be shown that they were needed for education or theatrical performance. The state issues over 10,000 permits for small exotic pets such as ferrets and Siberian hamsters, and less than three hundred for dangerous animals, including monkeys that perform at Bar Mitzvahs and casinos, and lions that get movie and television work. Animals are easy to find, and cheap. Exotic-animal auction houses and animal markets thrive in the Midwest and the Southeast, where wildlife laws are most relaxed, and on the Internet. One recent afternoon, I browsed the Hunt's Exotics Web site, where I could have placed an order for baby spider monkeys ($6,500 each, including delivery); an adult female two-toed sloth ($1800); a Northern cougar female with blue eyes, who was promised as 'tame on bottle'; a black-capped capuchin monkey, needing dental work,($1500); an agouti paca; a porcupine; or two baby tigers 'with white genes' ($1800 each). It is so easy to get a tiger, in fact, that the American Sanctuary and Shelter Association estimates that there are 6,000 pet wild tigers in this country -- about three times the number of registered Irish Setters or Scotties. One reason it is particularly easy to get tigers is that they breed easily in captivity. There are fewer than eight thousand wild tigers left in the world, and three subspecies have become extinct just in the last sixty years. In zoos, though, tigers have babies all the time. The result is thousands of 'surplus tigers' -- in the zoo economy, these are animals no longer worth keeping because there are too many of them, or because they're old, and zoo visitors prefer baby animals to mature ones. In fact, many zoos bred excessively throughout the seventies and eighties once they realized that baby animals drew big crowds. As a result, the trade in exotic pets expanded as animals were sold to dealers and game ranches and unaccredited zoos once they were no longer needed. In 1999, the San Jose Mercury News reported that many of the best zoos in the country including the San Diego Zoo and Denver Zoological Gardens regularly disposed of their surplus animals through dealers.. Some zoo directors were so disturbed by the practice that they kill their surplus animals rather than risk them ending up as mistreated pets or on hunting ranches. According to the Mercury News, the director of the Detroit Zoo euthanized two healthy Siberian tigers rather than sell them to animal dealers. Sometimes the dealers buy the animals just for butchering. An adult tiger, alive, costs two or three hundred dollars. Tiger meat from one large animal sells for $1000, and a tiger pelt sells for twice as much. By the time the tiger walked through town, Jackson was no longer a place you could go unnoticed if you had two dozen wild animals in your backyard. Between 1990 and 2000, the town's population increased by almost one-third, and cranberry farms and chicken farms began producing crops of condominiums and center-hall Colonials. It was probably inevitable that something would come to show the changing character of Jackson, its passage from a rural place to something new -- a bedroom community attached to nowhere in particular, with clots of crowdedness amid a sort of essential emptiness; a place with no urban character, even though it was so close to so many big cities, practically exploding with new people and new roads that don't connect to anything, and the fresh, clean sidewalks of cement that still looks damp; the kind of place made possible by highways and telecommuting and made necessary by the high cost of living in bigger cities and made desirable, ironically, by having the air of a simple and quaint country village. A tiger in town had, in a roundabout way, made all of this clear. In 1997, a model house was built on the land immediately east of the Maraseks, and in the next two years twenty-seven more houses went up. The land had been dense, brambly woods. It was wiped clean before the building started, so the new landscaping trees were barely toothpicks, held in place with rubber collars and guy wires, and the houses looked like they'd just been unwrapped and set out, like lawn ornaments. The development was named The Preserve. The houses were airy and tall and had showy entrances and double-car garages and fancy amenities like swimming pools and Jacuzzis and wet bars and recessed lighting and cost three or four hundred thousand dollars. They were the kind of houses that betokened a certain amount of achievement -- the classic suburban second house, a major promotion-to-company-vice-president house, very different from the faded old cottages tucked around the other side of the Maraseks' own trailer home and tiger pens. They were owned by people expecting a certain kind of suburban polish in the neighborhood, and who were disconcerted to note that on certain mornings, as they stood outside playing catch with their kids or pampering their lawns, there were dozens of buzzards lined up on their roofs, staring hungrily at the Maraseks' backyard. 'If someone had told me there were tigers here I would have never bought the house,' one of Marasek's neighbors said one afternoon. His name was Kevin Wingler, and where his lawn ends, the Maraseks' property begins. He is a car collector, and he was in his garage at the time, tinkering with a classic Corvette he had just bought. I drove through the Preserve and then out to a road on the other side of the Maraseks' land. This was an old road, one of the only ones that had been here when the Maraseks moved in, and the houses were forty or fifty years old and weathered. The one near the corner belonged to the owner of a small trucking company. He said he had helped Marasek clean up her facilities after the state inspection. He said he didn't think the wandering tiger was one of Marasek's because her tigers were so dirty, and the tiger that got shot looked clean and fit. He said that a few years before, Marasek had come by his house with a petition to stop the housing development. He didn't sign it. Still, he didn't want to get involved. The tiger had walked through Jackson for less than eight hours, an inscrutable and unaccountable visitor, and like many such visitors, he disturbed things. A meeting was held at City Hall soon after the tiger was shot. Four hundred people showed up. A number of them came dressed in tiger costumes. They demanded to know why the roving tiger had been killed rather than captured, and what the fate of the Marasek tigers would be. Somehow the meeting devolved into a shouting match between people who were from the new Jackson, insisting that Marasek's tigers be removed immediately, and the old guard, who suggested that anyone who knew the town -- and by implication, the only people who really deserved to be living there -- knew there were tigers in Holmson's Corner. They wanted to know why, if tigers bothered them so much, the people in the Preserve had been stupid enough to move in. Soon after the meeting, the state moved to revoke Marasek's wildlife permits. The town invoked its domestic animals ordinances, demanding that Marasek get rid of some of her dogs or apply for a formal kennel license. The homeowners in the Preserve banded together and sued the developer for consumer fraud because he had withheld information about the tigers in his off-site disclosure statement, which notifies homeowners of conditions like toxic dumps and prisons that might effect the resale value of a house. The neighborhood group also sued Marasek for creating a nuisance with both her tigers and her dogs. Here was where the circus began -- not the circus where Joan Marasek and her husband had worked and where she learned the recipe for 'Joan's Circus Secret', which is what she feeds her tigers -- but the legal circus, the amazing three-ring spectacle that has gone on for three years and still continues. It began when the state revoked Marasek's permit, citing inadequate animal husbandry, failure to show theatrical or educational grounds for possessing potentially dangerous wildlife, and grievously flawed record keeping. Without a permit, Marasek couldn't keep the animals. Marasek appealed, but the permit revocation was upheld. She appealed to a higher court. She was ordered to get rid of the animals while awaiting the results of her appeal of the permit case. She appealed that order. 'Tigers are extremely fragile animals,' she said at a press conference. She won that argument, which allowed her to keep the tigers during her permit appeal, as long as she promised to keep the tigers from breeding. In the meantime, the case revoking her permit was upheld, overturned, reviewed, and stalled while she changed attorneys five times. It moved up the legal chain until it sat before the highest state court, where in June, 2001, it was finally and conclusively upheld -- in other words, she was denied, once and for all, the right to keep tigers in New Jersey. The case of Tigers Only Preservation Society vs. State of New Jersey, Department of Environmental Protection, Division of Fish, Game and Wildlife reminded some people of the 1995 landmark lawsuit in Oregon against Vickie Kittles, who had 115 dogs living with her on a school bus. Wherever Kittles stopped with her wretched menagerie, she was given a tank of gas and directions to get out of town. She ended up in Oregon where she was finally arrested. There she faced a state attorney named Joshua Marquis, who had made his name prosecuting the killer of Victor the Lobster, the twenty-five pound mascot of the Seaside, Oregon, aquarium, who had been abducted from his tank. When the thief was apprehended, he threw Victor to the ground, breaking his shell; the lobster died three days later. Marquis was able to convict the man of cruelty to animals as well as theft. He decided to prosecute Kittles on the same grounds of animal cruelty. Kittles contended that she had the right to live with her dogs in any way she chose. Marquis argued that the dogs, which got no exercise and no veterinary care and were evidently miserable, did not choose to live on a school bus. After five minutes of deliberation the jury convicted Vickie Kittles of animal neglect and her dogs were sent to foster homes around the state. The Kittles case was the first prominent suit against an 'animal hoarder' -- a person who engages in the pathological collecting of animals. Tiger Ladies are somewhat rare, but there are Cat Ladies and Bird Men all over the country, and often they end up in headlines like '201 Cats Pulled From Home' and 'Pets Saved From Horror Home' and 'Cat Lover's Neighbors Tired of Feline Fiasco'. A study published by The Hoarding of Animals Research Consortium says that two-thirds of hoarders are females, and most often they hoard cats, although dogs, birds, farm animals, and, in one case, beavers, are hoarded as well. The median number of animals is thirty-nine, although many hoarders have more than one hundred. Hoarders, according to the Consortium, 'may have problems concentrating and staying on track with any management plan'. Recidivism among hoarders is close to one hundred percent. Take the animals away, the adage goes, and they'll have more on the way. Often they move from jurisdiction to jurisdiction to avoid the law. Last fall, at her first press conference since the tiger was found in town, Marasek told the Asbury Park Press that that she and her tigers were planning to move. The state of New Jersey would be very happy for Marasek to move, and to move soon. She said she was buying land 'elsewhere'-- she wouldn't name the state -- and would only say she would be moving 'sometime in the future'. In the meantime, the Department of Environmental Protection reserved homes for the tigers at the Wild Animal Orphanage in San Antonio, Texas. It was a rare offer, because a tiger epidemic was underway; in fact, two other sanctuaries that had at first agreed to take the Marasek tigers had filled up with other animals while the case stalled, and the Wild Animal Orphanage had been asked to take in forty more big cats from around the country. In early January, State Superior Court Judge Eugene Serpentelli held a hearing in the matter. The Tiger Lady wore a dark green pantsuit and square-toed shoes. She was edgy and preoccupied and waved off anyone who approached her except for a local radio host who has trumpeted her cause on his show and a slim young man who huddled with her during breaks. The young man was as circumspect as she was, politely declining to say whether he was a contributor to Tigers Only Preservation Society or a fellow tiger owner or perhaps someone with his own beef with the DEP. Throughout the hearing, Marasek dipped into a heavy black briefcase and pulled up sheets of paper and handwritten notes and pages downloaded from the Internet and passed them to her lawyer -- her fifth, who had just been retained a day before the hearing. The material was about the Wild Animal Orphanage and the USDA infractions it had been cited for over the years -- storing outdated bags of Monkey Chow in a shed with insecticides, for instance, and placing the carcass of a dead tiger in a meat freezer until its eventual necropsy and disposal. None of the infractions were serious and none remained unresolved, but they raised enough questions to delay the inevitable: once again, the state had to adjourn and schedule yet another hearing on how the Marasek tigers were going to leave town. The follow-up hearing was also postponed; the word is that the Tiger Lady was really ready to reveal details about how she planned to get the tigers out of town. I had been to Jackson a dozen times, circled the Maraseks' property, and walked up and down the sidewalks in the Preserve, but I had never seen a single tiger. I had even driven up to the Maraseks' front gate a few times and peered through it, and I could see a bunch of woolly white dogs scuffling behind a wire fence, and I could see tarps and trailers scattered around the house, but no tigers, no flash of orange fur, nothing. This is how I understood how this all had happened -- how a lady and twenty-some tigers could live unnoticed for so long, and how you might dismiss as a crazy rumor a story about wild animals in the woods even if you lived next door. You really could live your life here in the most usual way and never know what extraordinary thing was afoot just a few yards away; you would dismiss the occasional whiff of something weird or a roar at midnight because the alternative was simply too strange. Everything about the story was so surreal -- Marasek's personal history, the idea of collecting these creatures, the image of a tiger walking through the suburbs -- that I decided I really wanted to see one of the animals, to assure myself that they really existed, and mostly because I know that sooner or later, by the irreversible order of the New Jersey courts, these tigers will be taken away from this strange little patch in New Jersey. One afternoon I parked across from the Winglers and walked past their garage, where Kevin was still monkeying around with his red Corvette, and then across their backyard and beyond where their lawn ended, where the woods thickened and the ground was springy from all the years and decades of pine needles that have rained down, and I followed the tangy, slightly sour smell that I guessed was tiger smell, although I don't think I've ever smelled tigers before. There was a chain-link fence up ahead. I stopped and waited. A minute passed and nothing happened. A minute more, and then a tiger walked past on the other side of the fence, its huge head lowered and its tail just twitching, the black stripes of its coat crisscrossed with late-day light, its slow heavy tread making no sound at all; it reached the end of the fence and paused, and then turned back the other way, and then it was gone.